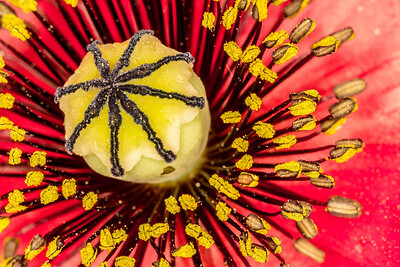 Photographs that feature a flower or flowers as a major feature. 2017 wasn't a spectacular year for bluebonnets in Texas, but there were fields scattered throughout the state that had prolific bluebonnets, as well as Indian paintbrushes. This was taken at one such field, outside Brenham, Texas. Available in the following sizes (Panorama A): 20x10, 24x12, 32x16, 40x20, 48x24, 48x24 Triptych (3 x 16x24), 60x30, 60x30 Triptych (3 x 20x30). 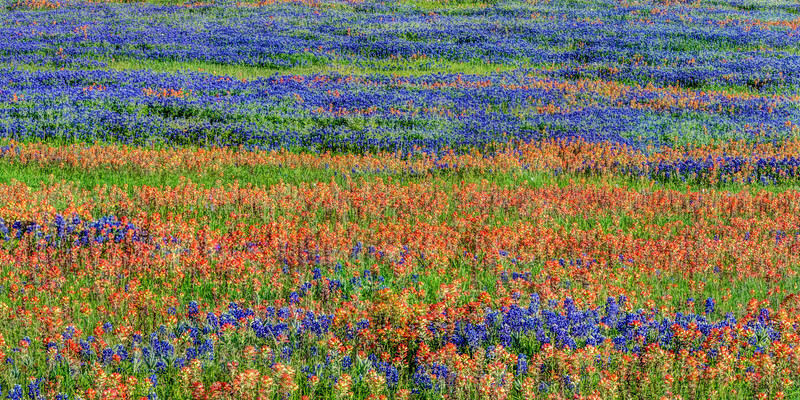 Entire fields in Texas erupt into blue, purple and red masterpieces in late March and early April, as the bluebonnets and Indian Paintbrush come into bloom. Here's one of the more dense fields of these flowers I saw while traveling through, in 2017. 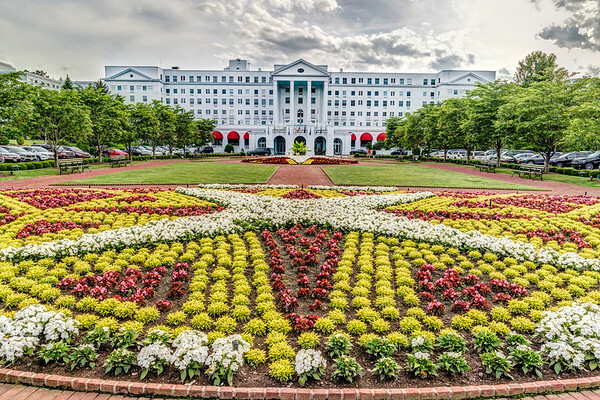 Available in the following sizes (Panorama B): 30x12, 40x16, 50x20, 50x20 Triptych (3 x 17x20), 60x24, 60x24 Triptych (3 x 20x24), 75x30, 75x30 Triptych (3 x 25x30), 90x36, 90x36 Triptych (3 x 30x36), 105x42 Triptych (3 x 35x42), 120x48 Triptych (3 x 40x48). 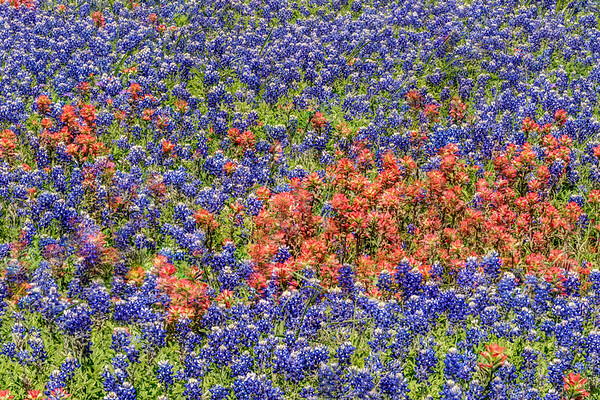 Entire fields in Texas erupt into blue, purple and red masterpieces in late March and early April, as the bluebonnets and Indian Paintbrush come into bloom. Here's one of the more dense fields of these flowers I saw while traveling through, in 2017. Available in the following sizes (Rectangle B): 12x8, 18x12, 24x16, 30x20, 36x24, 45x30, 60x40, 72x48. As of 2017, I have yet to find a huge field entirely filled with bluebonnets. 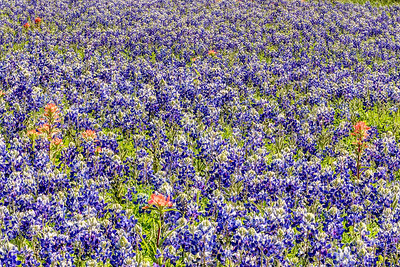 I did, however, spot this small but dense field of these beautiful and iconic flowers while driving through Texas Hill Country at the end of March, 2017. Available in the following sizes (Rectangle B): 12x8, 18x12, 24x16, 30x20, 36x24. I frequently appear at art shows in Texas in March and April while the bluebonnets are in bloom. 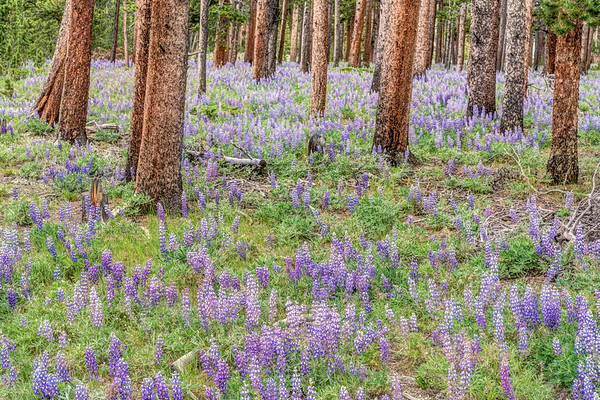 I always use these trips as an excuse to go out and shoot these beautiful, seasonal flowers. Here's a swallowtail butterfly atop an Indian Paintbrush, with a field of bluebonnets in the background. Available in the following sizes (Rectangle A): 10x8, 14x11, 20x16, 24x20, 30x24. I suppose it makes sense for flowers to grow as far north as Canada and Alaska, but I'd never really given it much thought until my trip to this area in the summer of 2016. The city of Dawson is a cute, little gold-rush town that thrives, today, as a tourist spot along the famous Alcan Highway, taking travelers through Alberta, British Columbia, and the Yukon Territory en route to Alaska. The city has a lot of historical buildings, including the commissioner's home, which hasn't been inhabited for close to a century, but is beautifully maintained as a historical site. The garden in front is kept as it was during the city's heyday, and one of the flowers that seems to grow best in the region is this species of poppy, which filled a large portion of the gardens in the region. Available in the following sizes (Rectangle B): 12x8, 18x12, 24x16, 30x20, 36x24. I took this photo about as far north as I have ever traveled, on the Yukon Territory's Dempster Highway. Earlier this day, I'd driven to the Arctic Circle, but returned a couple hours south to my hotel to spend the night. This photo was actually taken at 12:09 AM, and the sun had not yet set. Available in the following sizes (Rectangle B): 12x8, 18x12, 24x16, 30x20, 36x24, 45x30, 60x40, 72x48. 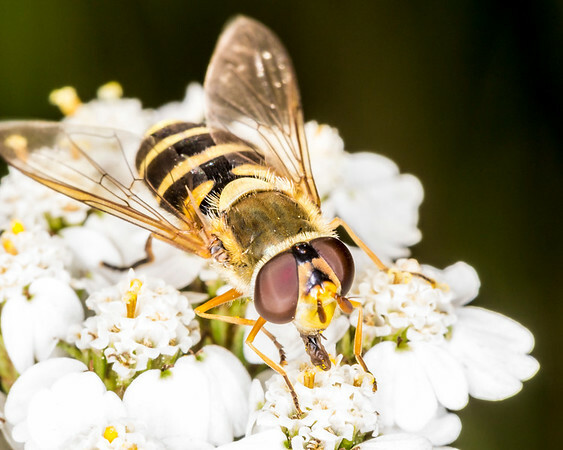 A cleverly-disguised fly. Available in the following sizes (Rectangle A): 10x8, 14x11, 20x16, 24x20, 30x24. 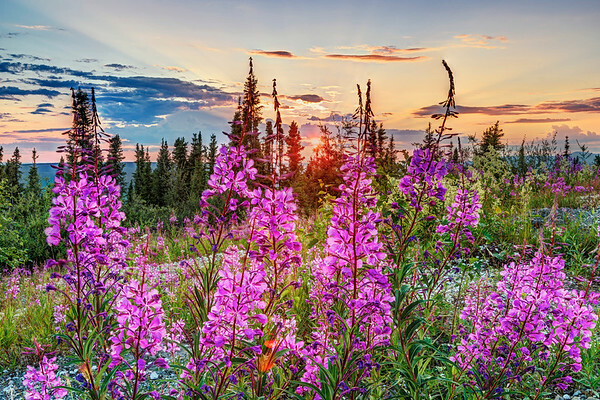 Although fireweed grows as far south as Arizona and New Mexico, it seems to be much more widespread as one goes further north. 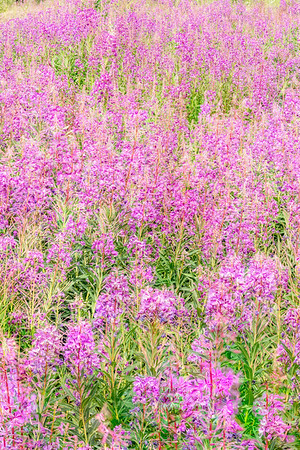 Summer in northern Canada and Alaska sees entire fields turn pink as this ubiquitous plant comes into bloom. Available in the following sizes (Rectangle B): 8x12, 12x18, 16x24, 20x30, 24x36, 30x45, 40x60, 48x72. I spent the summer of 2016 on an Alaskan camping trip. 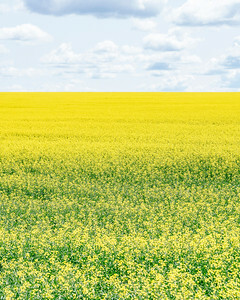 On the drive to Alaska from Colorado, fields of canola began to appear in Montana. 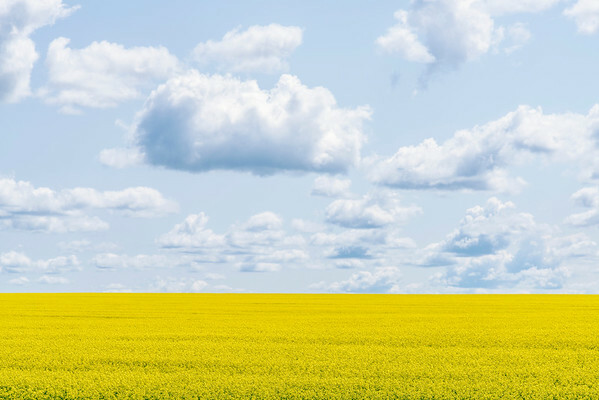 They continued along the side of the road for several hundred miles into Canada, but it wasn't until just outside of Dawson Creek, on the western (British Columbian) side of the BC / Alberta border, that a fully-blooming field came into view at the same time as a pleasing sky. I love the simplicity of this shot, as well as the contrast between the yellow foreground and the cloudy sky above. Available in the following sizes (Rectangle A): 8x10, 11x14, 16x20, 20x24, 24x30, 30x40, 40x50. I spent the summer of 2016 on an Alaskan camping trip. On the drive to Alaska from Colorado, fields of canola began to appear in Montana. They continued along the side of the road for several hundred miles into Canada, but it wasn't until just outside of Dawson Creek, on the western (British Columbian) side of the BC / Alberta border, that a fully-blooming field came into view at the same time as a pleasing sky. I love the simplicity of this shot, as well as the contrast between the yellow foreground and the mostly blue sky. Available in the following sizes (Rectangle B): 12x8, 18x12, 24x16, 30x20, 36x24, 45x30, 60x40, 72x48. 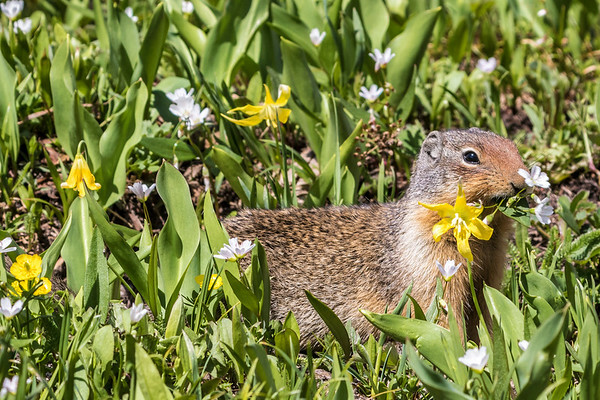 Columbian ground squirrels are prolific throughout Glacier National Park, in Montana. They're quite cute, and used to people being around, so one can get quite close to them, in order to get closeup shots, like this one, without scaring them off. They're fun to watch as they scurry around and bite the heads off flowers. Available in the following sizes (Rectangle B): 12x8, 18x12, 24x16, 30x20. 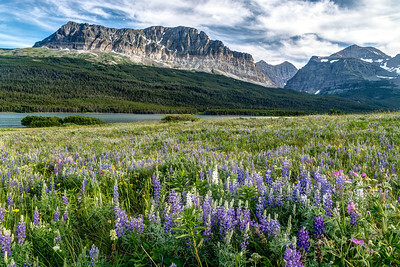 During my summer, 2016 visit to Glacier National Park, in northern Montana, the wildflowers were in full bloom. I'm not sure of the names of the mountains in the background of this photo, but they can be seen in the Many Glacier area of the National Park. Available in the following sizes (Rectangle B): 12x8, 18x12, 24x16, 30x20, 36x24, 45x30, 60x40, 72x48. The landscape photography I do typically takes place at sunrise and sunset. Mid-day light isn't usually any good for creating dramatic scenes, but I do like to shoot wildlife and flowers in the middle of the day. 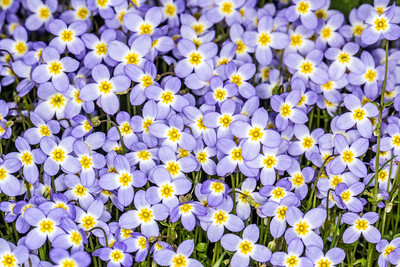 I shot these thyme-leaved bluets in early summer, in Tennessee's Great Smoky Mountains National Park. Available in the following sizes (Rectangle B): 12x8, 18x12, 24x16, 30x20, 36x24, 45x30. The landscape photography I do typically takes place at sunrise and sunset. Mid-day light isn't usually any good for creating dramatic scenes, but I do like to shoot wildlife and flowers in the middle of the day. 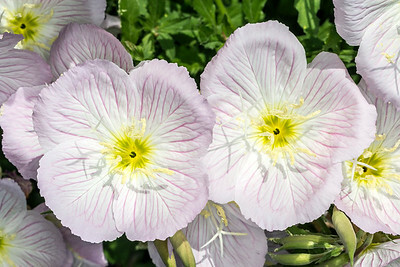 I shot these pink primroses in early summer, in Tennessee's Cherokee National Forest. Available in the following sizes (Rectangle B): 12x8, 18x12, 24x16, 30x20, 36x24, 45x30.